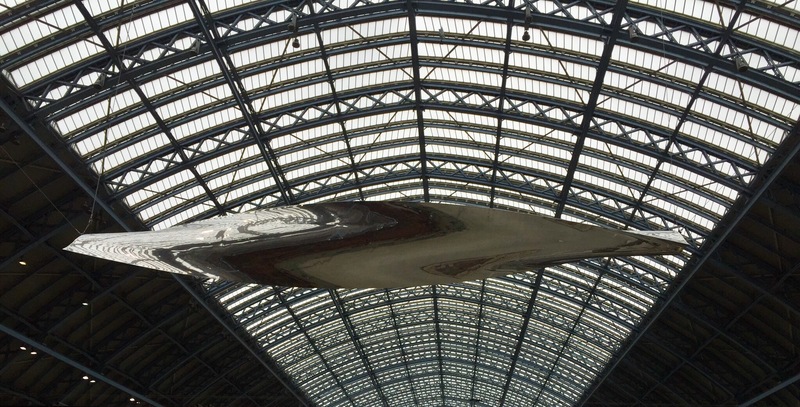 On show in St Pancras International Station, London, until January 2017, is this 18-meter aluminium artwork by Ron Arad. Designed by a man from Tel Aviv, made by Dutch shipbuilders and erected by British riggers, the sculpture floats, suitably internationally, above a border control point. The station now has 48 million visitors per year and is, as you would expect, bustling. This temporary installation draws eyes upwards as it barely rotates, reflecting the light from the glass above. That roof, designed by William Henry Barlow, was itself a wonder when first erected; in 1868, it was the world’s largest single-span construction. The combination of the two – the glass and the aluminium structures – stills the viewer. I love it now, but have had an affection for St Pancras station since childhood, when it was dark, dingy and dirty – covered in soot as a relic from from the days of steam. A little later, yet long before it became ‘International’, I was a teenager there, in the grimy early hours of a Sunday morning, waiting to catch a slow ride back on the paper train after a night out in town. Next ›Are You Able, Mabel?